1: Access to our Shooter Skill Video Archive. This library consists of training videos and drills to assist you in building the fundamental shooting skills that every Guardian needs. We add to this library every month with new videos and members have immediate access to the entire library. Browse by skill or by situation. Watch the videos and download the printable drill sheets that you can take to the range with you. 2: Access to Guardian Live Broadcasts. These are LIVE video Q&A broadcasts with top industry experts and operators. Guardian Nation members can login live each second Thursday of the month at 7pm Mountain time. Members also have access to the recordings of all broadcasts. 3: Immediate 10% off ANY product we sell on our site from optics to holsters. Books, tactical vests, training tools and backpacks. Anytime you are logged in all prices will be reduced 10%… just like that. 4. You will receive our Guardian Gear Box. The Guardian Gear Box is a quarterly gear box that we only send to eligible members of Guardian Nation. We send it out every February, May, August, & November. It includes tactical gear that you as a Guardian will need. You never know what will be included but it always has a minimum retail value of $114 (basically the same cost of your membership dues each quarter) and trust me it will rock your world! 5. Each year you will receive a $100 certificate to put toward an in-person class from any instructor in our network of 50+ instructors in 25+states. Class options include everything from a basic concealed carry class to advanced pistol and home defense courses! 6. Ongoing 5% Discount On Purchases on AmmoSupplyWarehouse.com. Enjoy further savings on the lowest cost brand-name ammunition in the industry! 7. Ongoing Member-Only Discount on Honor Defense Handguns. Enjoy the American Honor Guard 9mm at a steep discount! 8. You get access to shop our Black Friday & Happy Birthday America Member-Only Sales! 40-80% off top industry tactical gear and accessories. *PLUS: You will receive your welcome kit with our exclusive Guardian Nation T-shirt AND our exclusive Guardian Nation Series 1 Handgun Cleaning Mat. These are not products that can be bought on our site or in stores. The ONLY way to get them is to be a member of Guardian Nation. The Welcome Kit! 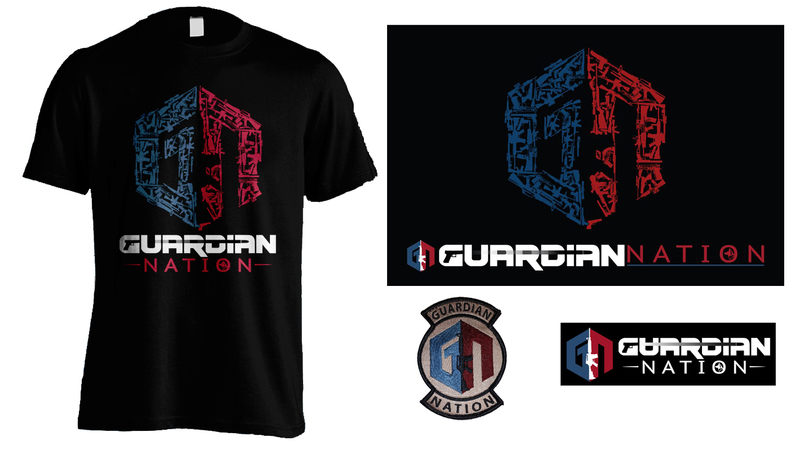 All Guardian Nation Members receive this custom t-shirt, gun cleaning mat, patch, and sticker! We encourage you to be a Guardian Nation Member today! How Will Guardian Nation Help You Prepare? We started writing things down on the whiteboard in the office. Mostly the things we wrote down were related to having the right shooting skills. Naturally building those skills comes down to getting the right training and then doing the necessary drills/practice to build the skill. A lot of the other things we wrote down on the board were related to having the right gear. Having the best stuff can not only be expensive it can also be hard to find without the right coaching and hours of research. With those two key ideas in mind, we brainstormed about 30 different ways we could get the right training and tools to American Gun Owners. The problem was that most of our ideas were either overly complicated or would end up being overly expensive for the gun owner. You see, by creating a monthly membership it is a lot easier for us to hire the people and invest the time and resources to product high-quality training content, drills, and videos because you would be sharing the cost with thousands of other gun owners who have taken classes from us in the past or who have purchased product from our website. Also, by including a quarterly box in the membership; we can get huge discounts on the best gear out there because we can negotiate on behalf of thousands of members. That means huge savings that allow us to pass that on to you and ensure you have what you need to defend your families and survive anything. And obviously the other benefits of Guardian nation like the discounted annual in-person course, the 10% discount on our store, Guardian Live Broadcasts, and the community are all rooted around us doing what we do best and leveraging the large numbers of members like yourself to make sure you have the rights skills and the right gear at a reasonable and affordable price. Not ready to commit? Click here to get a 14 day free trial.